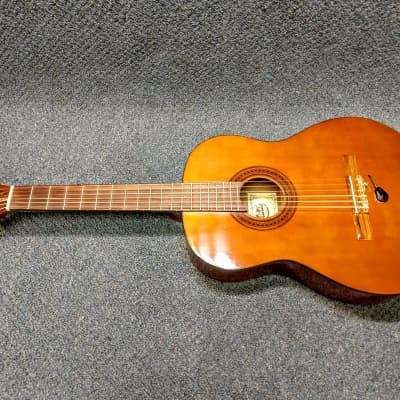 The Hondo guitar company was originally formed in 1969 when Jerry Freed and Tommy Moore of the International Music Corporation (IMC) of Fort Worth, Texas, combined with the recently formed Samick Company. IMC's intent was to introduce modern manufacturing techniques and American quality standards to the Japanese and Korean guitar manufacturing industry. The Hondo concept was to offer an organized product line and solid entry-level market instruments at a fair market price. The original Korean products were classical and steel-string acoustic guitars. In 1972, the first crudely built Hondo electrics were built. However, two years later the product line took a big leap forward in quality under the new Hondo II logo. Hondo also began limited production of guitars in Japan in 1974. Hondo acoustic guitars were particularly noted for having a sweet tone. Hondo was one of the first overseas guitar builders to feature American-built DiMarzio pickups on the import instruments beginning in 1978. By this year, a number of Hondo II models featured designs based on classic American favorites; these copies were very good instruments and have become highly collectible. The Gibson L5 copy, nicknamed FatBoy, was the top of the line, a superb instrument with very good woods and excellent sound. In 1979, over 790,000 Hondo instruments were sold worldwide. All guitar production returned to Korea in 1983. At that point, the product line consisted of 485 different models. In 1985, IMC acquired major interest in the Charvel/Jackson Company, and began dedicating more time and interest in the higher end guitar market. The Hondo trademark went into mothballs around 1987. However, Jerry Freed started the Jerry Freed International Company in 1989, and acquired the rights to the Hondo trademark in 1991 (the "Est. 1969" tagline was added to the Hondo logo at this time). Freed began distribution of a new line of Hondo guitars. In 1993, the revamped company was relocated to Stuart, Florida; additional models added to the line were produced in China and Taiwan. The Hondo Guitar Company was purchased by the MBT International (now Musicorp) in 1995. The Hondo product line was revamped for improved quality while maintaining student-friendly prices. Hondo celebrated their 25th year of manufacturing electric guitars in 1997. Musicorp also owns and distributes J.B. Player instruments which replaced Hondo in 2005. Vtg Hondo 5 String Banjo II With Extras Great Cond. LOOK!! !